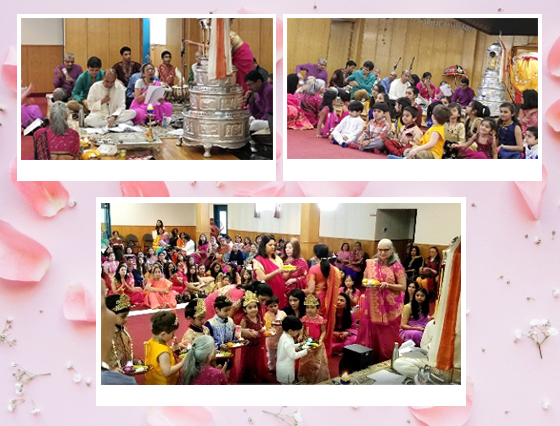 Jain Society of Ottawa Carleton celebrated Mahavir Jayanti on Sunday, April 16 at the Hindu temple in Ottawa, Canada. The Jain population in Ottawa is quite small, at about 100 members. However, at our annual celebration of Mahavir Jayanti they attract a large crowd from the wider community. This year they had about 450 in attendance. The popularity of the program is no doubt because of its rich content, from Pooja, bhajans, dances, illustrated presentation on a basic tenet of the faith, to the narration of some beautiful quotes from the Jain writings that are interspersed throughout the program. Each year there is something new. Many of those present find it a soul-uplifting experience. The highlight of the program this year, as in the previous years, was the participation of young children, presenting a dance or dressed as Devi Devatas offering Arghya during the Mahavirpooja. The Samivatsal after the program, in which most of the dishes were prepared by members of own group, was another highlight.